Former New York City Mayor Rudy Giuliani (R) thinks Rev. Al Sharpton is inciting potential violence in Ferguson, Missouri, ahead of a grand jury ruling on the controversial death of an African-American teen who was shot by a local police officer. “Putting pressure on grand juries to indict in my view is un-American. A grand jury should be allowed to be fair and impartial. 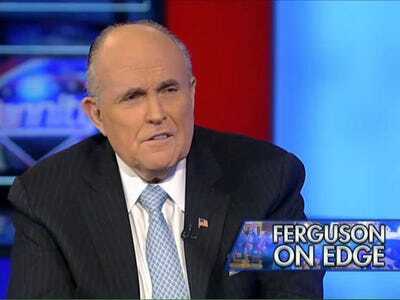 They shouldn’t have people yelling and screaming, ” Giuliani said of Sharpton on “Hannity” Monday night. Giuliani, a longtime Sharpton foe, made the comments in response to video clips of Sharpton rallying activists for justice in the St. Louis suburb, which has been rocked by racially charged protests since the summer. The demonstrations started in August after the killing of an unarmed teenager, Michael Brown, by a white police officer, Darren Wilson. A grand jury is expected to imminently announce its decision on whether it will indict Wilson. “In order to establish peace, you must have fair justice for everyone. We want real peace; we don’t want to just be told to shut up and suffer in silence,” Sharpton said in one of the clips. Giuliani, however, argued Sharpton was pushing for the jury to prejudge Wilson and for demonstrators to potentially become violent if the officer is not indicted. Sharpton did not immediately respond to a request for comment about Giuliani’s remarks from Business Insider. View Giuliani’s full “Hannity” interview below.